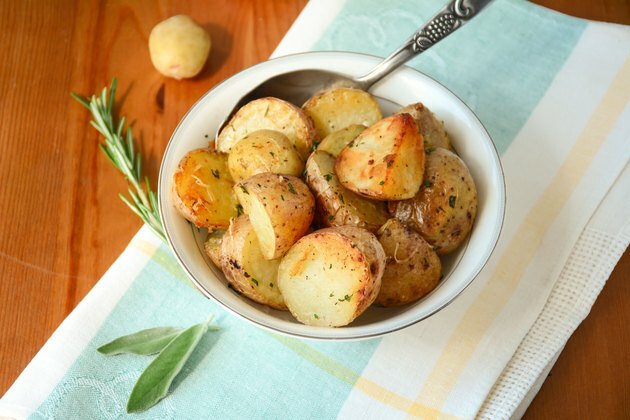 Boiling your potatoes before you toss then into the oven helps the pieces develop a crispy outside coating. The boiling period also reduces the time you have to bake the potatoes to cook them completely and make them crispy. The potato pieces only need a short amount of time in the boiling water to get the cooking process started. Bite-sized pieces work best for this method of cooking. Use any type of potato to create the crispy side dish. Peel the skin off of the potatoes. Rinse the peeled potatoes to remove any remaining dirt. Cut the potatoes into 1-inch chunks, adjusting the size as desired to make the chunks larger or smaller. Place the potato chunks in the saucepan. Cover the potatoes with cold water and add a pinch of salt. Place the potatoes over high heat until they come to a boil. Continue boiling the potato chunks for 5 minutes. Drain the potatoes, shaking them to soften the edges. Pour 2 to 3 tablespoons of olive oil into a roasting pan. Place the pan in the oven at 425 F to heat the oil. Dump the potatoes into the pan, tossing slightly to coat. Sprinkle in the desired seasonings like salt, pepper, garlic and rosemary. Toss the potatoes again to spread out the seasonings. Bake the potatoes for 45 to 60 minutes. Stir the potatoes every 15 minutes so they crisp evenly. Test the potatoes by cutting into them and tasting them to check for a soft middle and crisp outside.